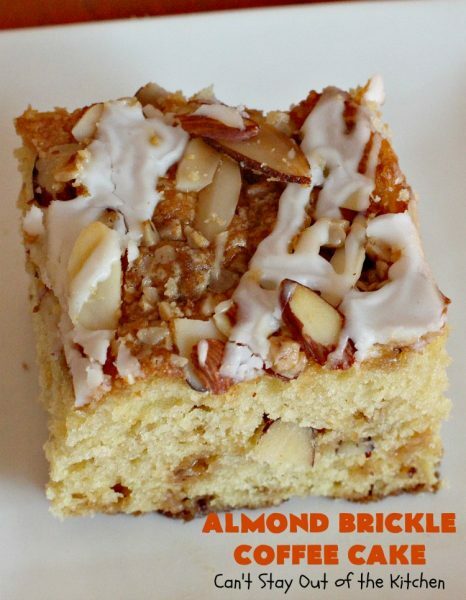 Almond Brickle Coffee Cake is absolutely superb. This coffee cake is great for breakfasts and brunches. Or for that matter, serve it anytime of the day! The cake is filled with Heath English Toffee Bits and is flavored with both almond and vanilla flavorings. There is a streusel layer in the middle of the coffee cake and on top, as well. 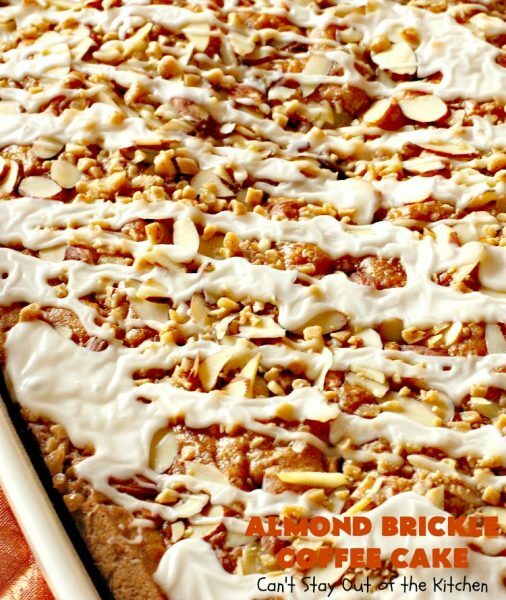 It consists of sliced almonds and more Heath English Toffee Bits. Finally, there is an amazing powdered sugar glaze on top with almond flavoring. 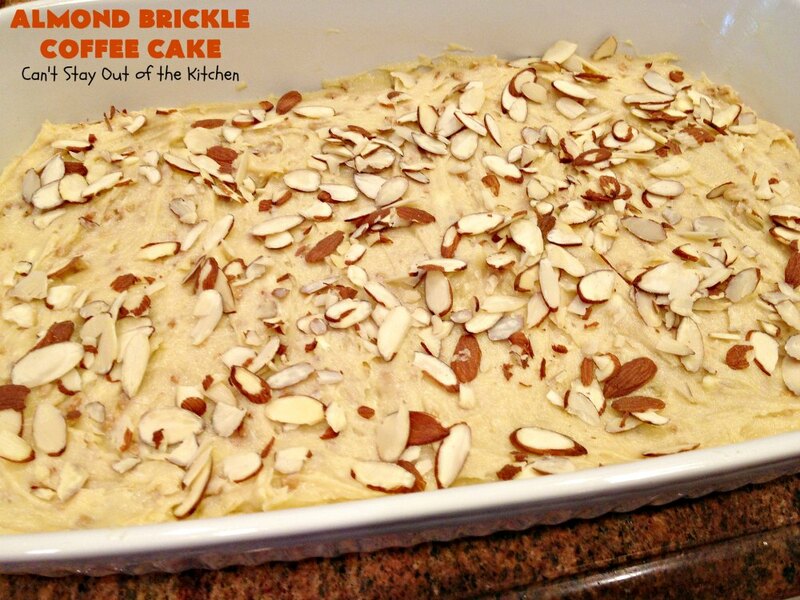 It makes this delicious coffee cake rock! If you like almonds and English Toffee Bits this coffee cake recipe is to die for! I am constantly looking at new recipes. My youngest son thinks I should be called the “casserole queen.” However, I think my true name should be “recipe queen.” I LOVE to pour through recipes. Whether that be from cookbooks, online recipes, or from the backs of packages I purchase. Some of my best recipes have actually come from the backs of ingredients I have bought at the store. 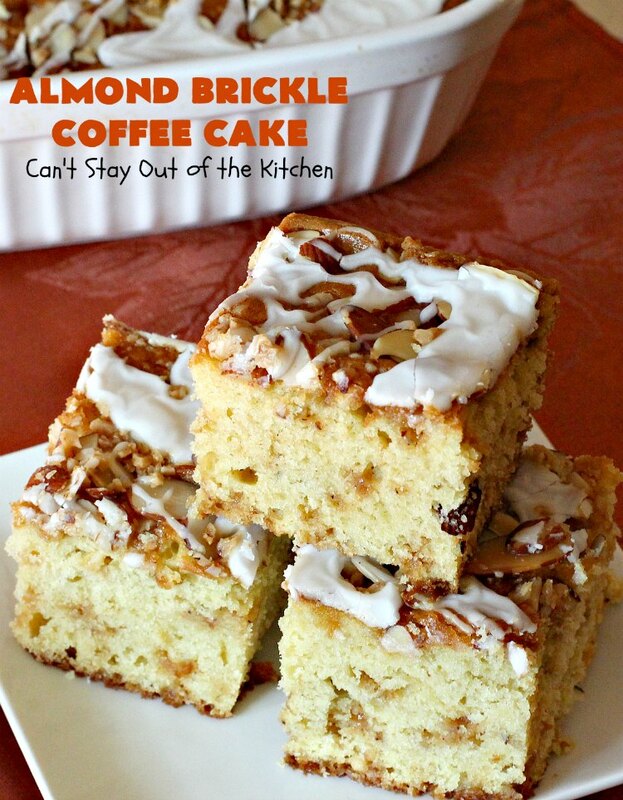 Almond Brickle Coffee Cake is no exception. I found this delicious recipe and modified it from the back of a Land O Lakes unsalted butter package. I was in the middle of my Christmas Cookie Baking Extravaganza last year. I was getting ready to throw the butter packaging into our recycling bin. Then I realized it had a recipe inside. I ALWAYS look at recipes on anything I purchase before discarding them. I looked at the ingredients and thought this recipe might be worth a try. So I cut it out and pasted it into one of my huge 5-inch-wide 3-ring binder cookbooks! Oh, my, am I ever glad I saved this recipe! I doubled the ingredients of Almond Brickle Coffee Cake, because I needed to make a large pan of the coffee cake. Then I added a bag of Heath English Toffee Bits to the actual cake. Wow, did that ever bump up the flavor. I increased the leavening ingredients and changed the amounts on the glaze. 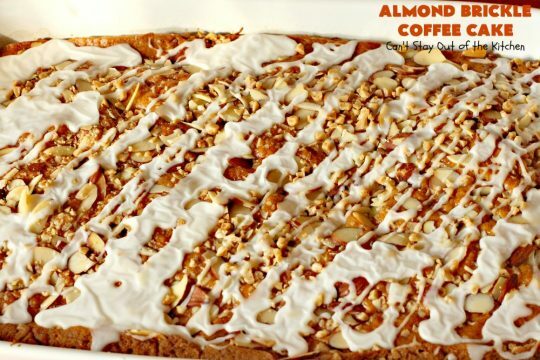 The recipe actually calls for the almonds to be toasted. I was in the middle of baking four different coffee cake recipes that day. I missed that part of the instructions and just spread the almonds on plain. This coffee cake was spectacular. I just loved the rich, almond taste mixed with the English toffee bits. I will be making this recipe often in the future. 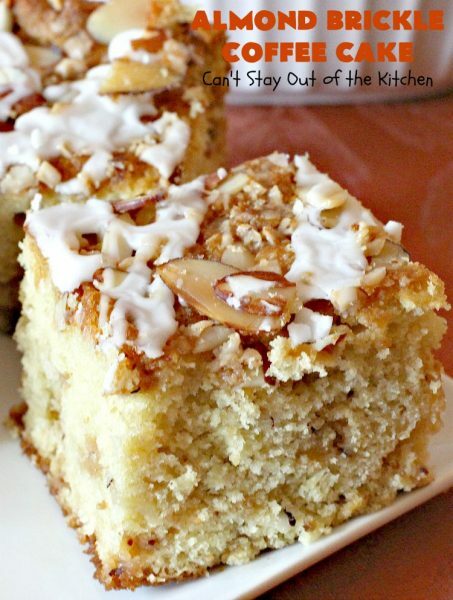 I’ll make this whenever I need a great tasting coffee cake for breakfast, brunch, a baby shower, or a potluck. It’s just terrific. Almond Brickle Coffee Cake is a spectacular tasting coffee cake to serve for breakfasts and brunches. 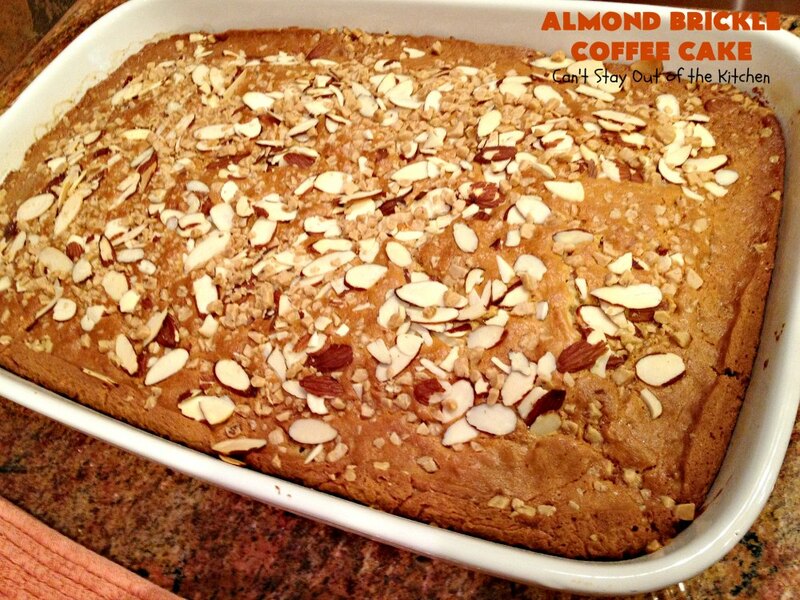 If you like almonds and Heath English toffee bits, you will LOVE this coffee cake. Your family will keep coming back for more of this splendid coffee cake! 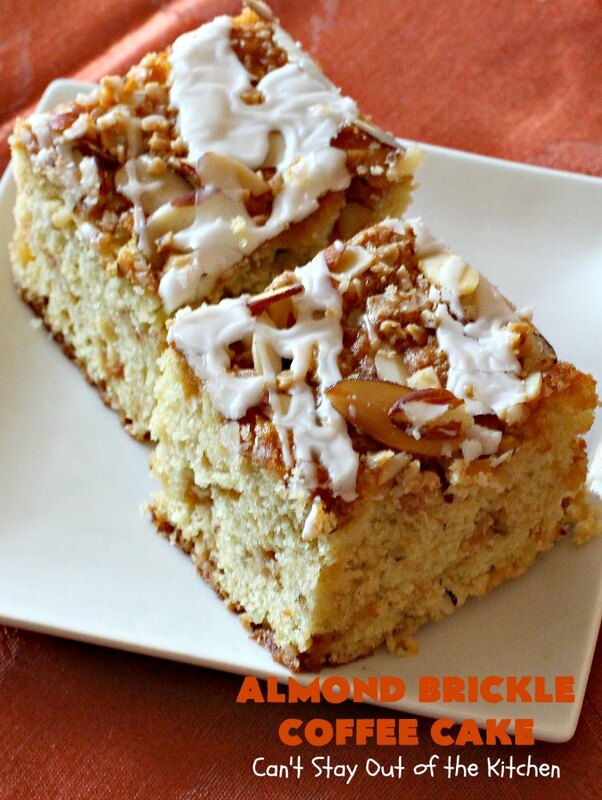 Almond Brickle Coffee Cake is sure to please the most discerning palate! I made a really thick glaze for the coffee cake. Otherwise, if you water down the powdered sugar too much, it just dissolves into the cake rather than stay on top so you can see it! Soften butter. These pictures show only a half batch. I had to whip up another half when I realized the original recipe was only going to be enough for a 9″ round cake pan. Add sugar, eggs and vanilla and almond extract. I increased the almond extract to give the coffee cake a boost of flavor. Add baking powder, baking soda and salt. Mix with an electric mixer to combine. Add UNBLEACHED all-purpose flour. Bleached flour toughens baked goods. Add an 8-oz. bag of Heath English Toffee Bits. Spray a 10×15″ glass baking dish with cooking spray. Spread HALF of the batter into the prepared pan. Sprinkle with half the almonds from the streusel. Sprinkle with half the Heath English Toffee Bits from the streusel. Cover with remaining batter and smooth the top. Sprinkle with remaining almonds (you can toast these if you prefer). Sprinkle with remaining Heath English Toffee Bits. Bake at 350 about 45 minutes or until toothpick inserted in center comes out clean. This will take longer to bake if you try to squeeze all this batter into a 9×13″ pan. 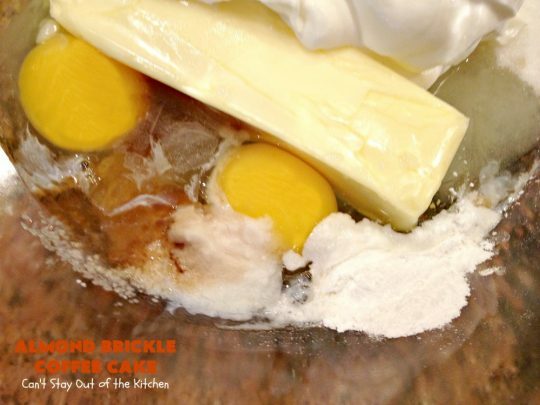 You may even have the batter spilling out of the pan. Yikes! 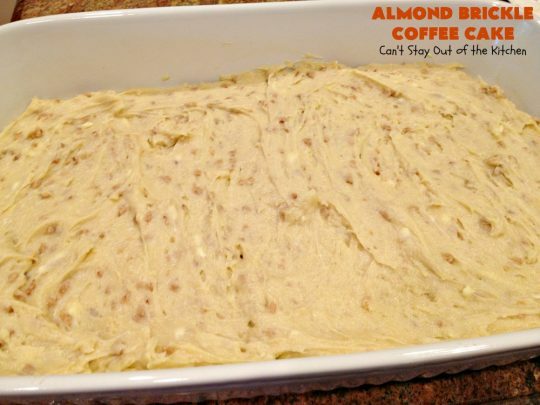 Allow the coffee cake to cool completely. Meanwhile, make up glaze: place powdered sugar into a bowl. 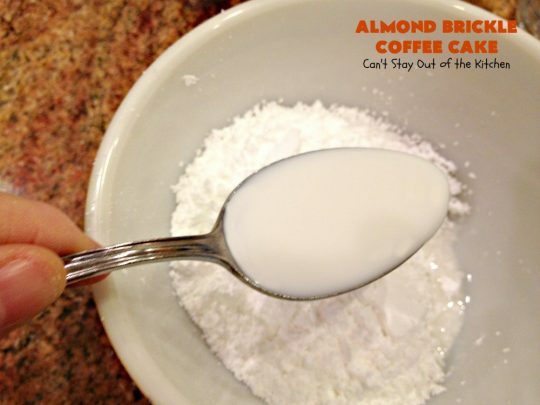 Add almond extract and milk. I can’t emphasize enough – start with a tablespoon, then add another, and only add the last one if you absolutely cannot stir the icing. If you add too much milk then the icing gets thin and runny and dissolves into the cake, which means you will have to start over and try again or add more powdered sugar to get the icing to the right consistency! Whisk ingredients until no lumps remain from the sugar. Drizzle powdered sugar glaze over top of the coffee cake. Allow the icing to dry completely before cutting–about 15-20 minutes usually. Cut coffee cake in the sizes you desire. I cut this large pan into 24 nice-sized portions. You can see how the Heath English Toffee Bits kind of melted into the cake. So luscious! Doesn’t Almond Brickle Coffee Cake look heavenly? You can tell that I made the icing quite thick. It’s so much easier to work with to drizzle if the powdered sugar glaze is thickened. 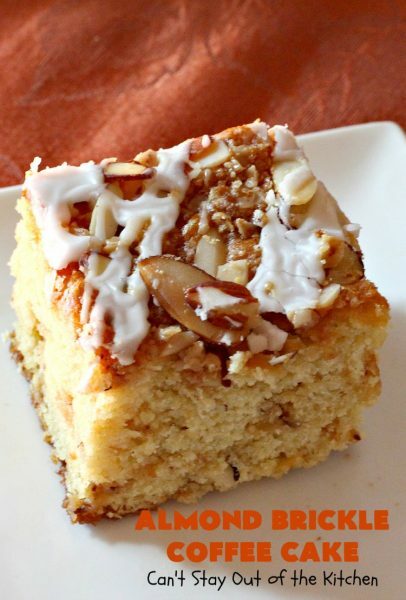 Absolutely scrumptious coffee cake recipe loaded with almonds and Heath English toffee bits and iced with a powdered sugar icing. It's terrific for a holiday or company breakfast or for dessert. It's also great for baby showers, potlucks or weekend breakfasts. Combine sugar, butter, eggs, almond and vanilla extracts, sour cream, baking powder, baking soda and salt with an electric mixer. Stir in flour and Heath English Toffee Bits with a wooden spoon and combine. Spread half of the coffee cake mixture into a 10x15” glass baking dish that has been sprayed with Baker’s Joy cooking spray. If desired, spread almonds in a glass dish and toast in oven about 5-8 minutes at 350°. 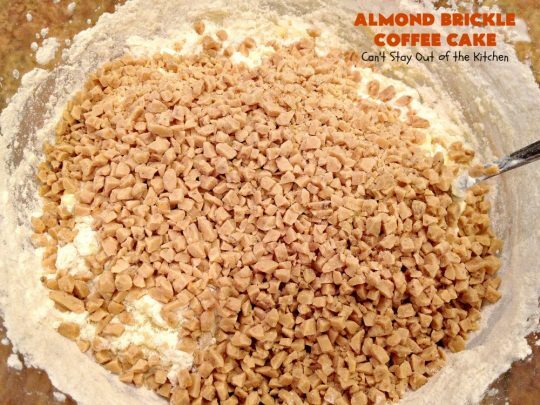 Sprinkle half the almonds and half the English toffee bits over top of the batter. Spread remaining batter over top of the streusel. Bake at 350° about 40-45 minutes or until toothpick inserted in center comes out clean. 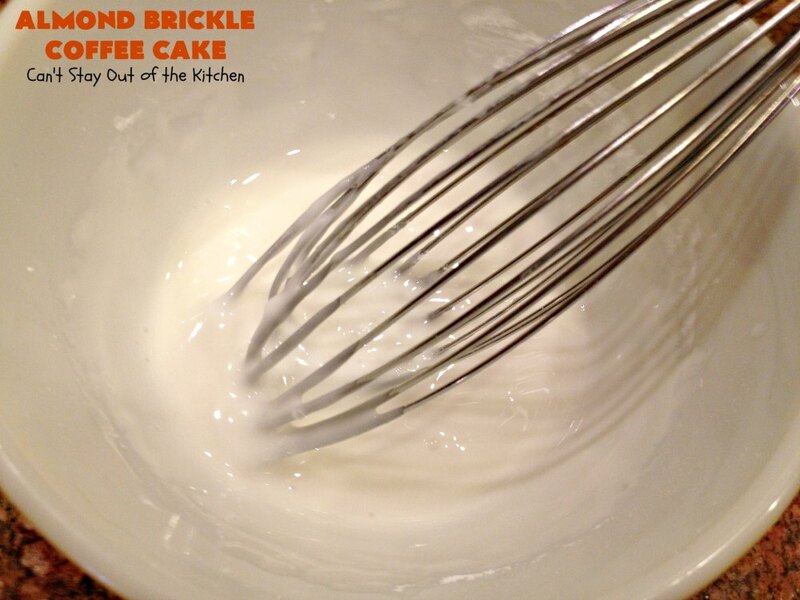 Combine ingredients using only as much milk as necessary so the glaze will not be too thin or it will dissolve into the cake. NOTE: If you do not have a large 10x15” pan and have to substitute a 9x13” pan, the cake is going to take additional cooking time. It also may spill out of the pan. I recommend a large roasting pan if you do not have a 10x15" baking dish or pan. Recipe adapted from Land O' Lakes. Absolutely scrumptious coffee cake recipe loaded with almonds and Heath English toffee bits and iced with a powdered sugar icing. 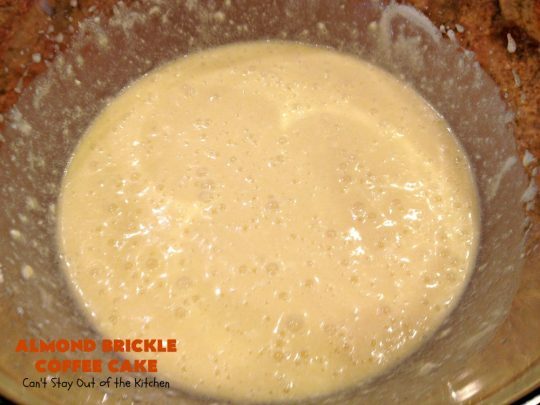 Spread half of the coffee cake mixture into a 10×15” glass baking dish that has been sprayed with Baker’s Joy cooking spray. If you do not have a large 10×15” pan and have to substitute a 9×13” pan, the cake is going to take additional cooking time. You can add the glaze any way you desire. I chose to drizzle it on the diagonal and only one way. Almond Brickle Coffee Cake is a marvelous recipe to use in your holiday baking or for special occasions. 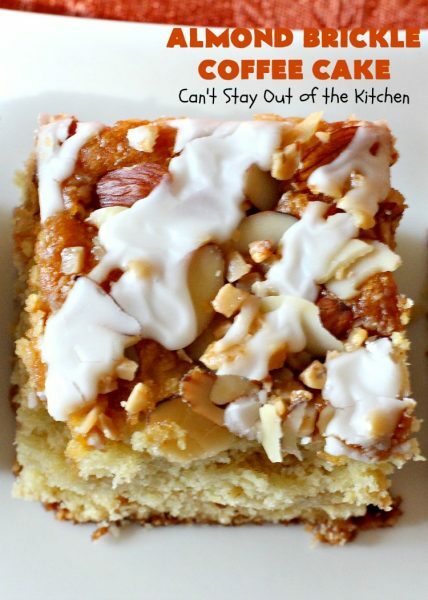 This scrumptious coffee cake is sure to become a family favorite! This side view shows the Heath English Toffee Bits inside the cake. 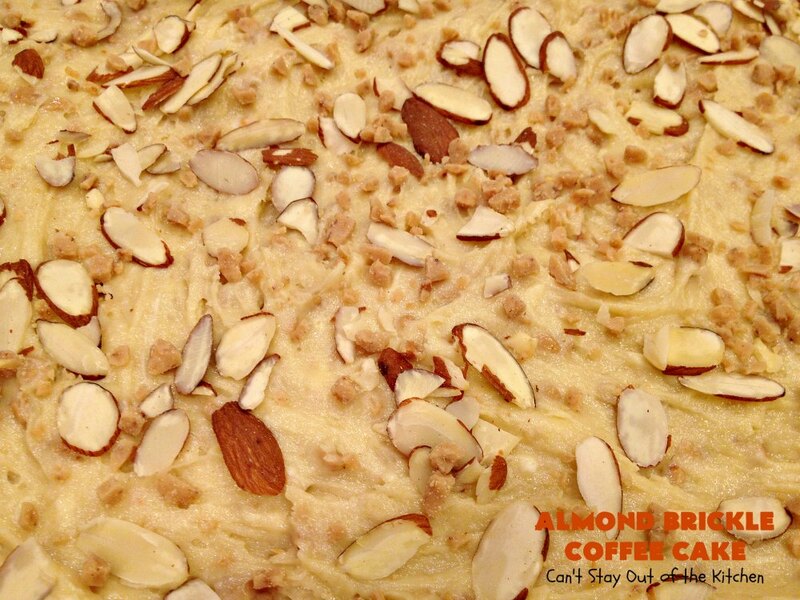 Take a tray of Almond Brickle Coffee Cake out to your office one day and it will be consumed in no time! The combined tastes of almonds and toffee bits were incredible. This cake presents so beautifully that this is a great recipe to bake for special occasions like baby showers, birthday breakfasts, or parties. Ha–ha!! Same here. I found the recipe, tried, liked it. It is delicious! Thanks Marina. I thought it was terrific.